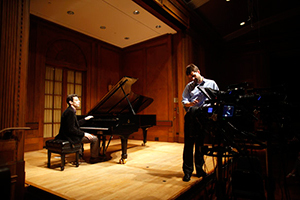 Pianist Jonathan Biss and the Curtis Institute of Music have partnered with Coursera -- the leading provider of Massive Online Open Courses" (MOOCs) -- to offer a free, online course on Beethoven's piano sonatas. Biss has recently released Volume 2 of a decade-long project to record all of the pieces. Over 30,000 people have enrolled in the course to date, seven times the total number of students who have attended Curtis since the school opened its doors in October 1924. The five-week course launches this Tuesday, September 3, 2013 -- the first day of Curtis classes -- and is aptly named Exploring Beethoven's Piano Sonatas. Biss has posted recommended reading and listening materials here. In the course description, Biss writes, "It is not necessary to have studied an instrument or to have any knowledge of music theory to take the course. Rather, it is designed for students of all backgrounds who have a desire to learn more about Beethoven and his world." Of the collaboration with Curtis -- where Biss is both an alumnus and the Neubauer Family Chair in Piano Studies professor in Piano Studies -- he says, "I am so thrilled to be working with Curtis on this new endeavor. As a musician, whether I'm performing, rehearsing, teaching, or even just listening, my greatest joy -- the whole point, really -- is in sharing music. I am enormously grateful to Curtis for the incomparable education I received there, and for the constant creative stimulation I find in working with its students today. But now, through Coursera, I have the opportunity to connect with students and lovers of music on a scale I never imagined was possible. As much as I cherish the one-on-one interaction I have with the students within Curtis's walls, I find this opportunity to share that experience with people the world over incredibly exciting."